Established as a Cathedral in 1877, the architecture of The Cathedral and Abbey Church of St. Alban dates back to up to 700 years ago. With its 84m long nave making it the longest of its kind in Britain, it is perhaps unsurprising that this Cathedral is the second largest in Britain after Winchester Cathedral. The Cathedral houses some fascinating history and is widely claimed as being located on the exact spot on which Britain’s first Christian martyr, St. Alban, was beheaded. Whether or not this is correct, he was certainly buried there. Consisting of a diverse mix of architectural styles due to its longevity, it isn’t hard to believe that this Cathedral is Britain’s oldest site of continuous Christian worship. The building work ranges from Anglo Saxon influence, seen in the first floor gallery, through to extensive Norman design and even further into the 1500s. From that period onwards the Monastic site suffered extensive damage through disrepair and bad weather; and despite the repair work that has been carried out consistently over hundreds of years, some of the buildings were decommissioned from the monastic collection and became part of the local area instead. This paints a clear picture of how grand the site was as the Cathedral is famed for its astonishing size. All of this history is bound to make you peckish so a visit to The Abbot’s Kitchen for a snack or some lunch will be on the cards. This highly recommended eatery was nominated for Best Local Café and Most Family Friendly Café at the St. Alban’s Food and Drink Festival. 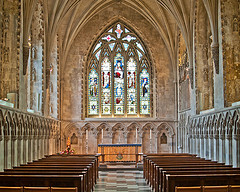 A trip to St. Alban’s Cathedral and Abbey Church promises to be a wonderful way for you and the kids to explore the marvels of grand design and the importance placed on religion over the ages. Opening Times: 9:30am-5:45pm all year round.